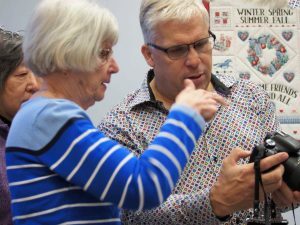 On Saturday the 27th of October, eleven participants assisted by GPG volunteer facilitators attended this second Guelph Photographers Guild Basic Digital Photography Workshop at the Evergreen Seniors’ Centre in Guelph. 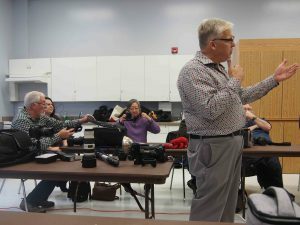 Everyone appeared to enjoy themselves while learning how to unleash the range of semi-automatic and fully manual capabilities of their digital cameras. They learned how to move beyond using only its fully automatic mode. Our workshop format uses a series of brief presentations, followed by corresponding breakout sessions with facilitators experienced in the same brand of camera as each user. After a break for lunch, some of us reconvened at the nearby Riverside Park for an open air workshop, where participants could practice their new skills with the support of experienced facilitators. 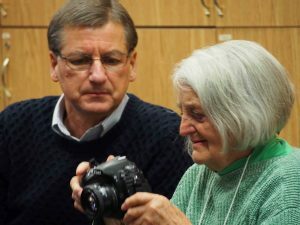 This course was free to current members of the Guelph Photographers Guild. Non-GPG members are eligible to receive a credit for their workshop fee if they join the GPG before the end of 2018.